Throughout the Renaissance Era, herbalism was often studied and practiced in juxtaposition with 2 of the sacred sciences of the Hermetic tradition: alchemy and astrology. These vast subjects provide a metaphysical backbone to the philosophy and practice of clinical western herbalism, as well as refined methods of harvesting, preparing, and administering plants in a way that is in accordance with the spirit, energetics, and chemistry of our herbal remedies. In this 2-day workshop, you will learn the fundamental principles of western alchemy and medical astrology, including how to prepare spagyric medicines, determine astrological correspondences in plants, and cultivate a truly holistic philosophy and practice of herbalism that unites the above and below, the spirit and the body of both people and plants. This model gets far beyond the use-this-herb-for-that-symptom model of allopathic herbalism and into a holistic approach that allows you to find the specific remedy that matches the specific constitution and temperament of the people you serve. Sajah Popham, founder of Organic Unity and The School of Evolutionary Herbalism, is a student of the universal truths found within both ancient and modern herbal traditions from around the world. The focus of his work is on integrating ancient teachings for a new paradigm of plant medicine, one that is truly holistic in its honoring of the spirit, energetics, and body of both people and plants. His unique synthesis bridges herbalism not only east and west, but north and south, above and below, into a universal philosophy that encompasses indigenous wisdom, Ayurveda, western Alchemy and Spagyrics, Astrology, clinical herbalism, and modern pharmacology. Sajah’s vitalist approach utilizes plants not only for physiological healing and rejuvenation, but for the evolution of consciousness, for a truly holistic practice of plant medicine. Sajah’s teachings embody a heartfelt respect, honor and reverence for the vast intelligence of plants in a way that empowers us to look deeper into the nature of our medicines and ourselves. He lives in southern Oregon with his wife where he teaches at his school, makes spagyric medicines, and practices his art. 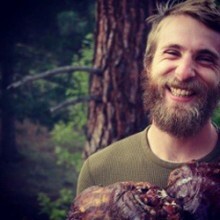 For more information about his products and programs, visit www.organic-unity.com and www.evolutionaryherbalism.com.